I had scored this light breezy piece of clothing on a discount at Nordstrom. I was so excited because it was colorful (means would go with a lot of tops), had stripes (who doesn't love stripes), and was of great quality (a must in my books). And I am happy to report that three years later, it is still my summer staple. I get a lot of wear out of it, especially during the hot and humid days of summer in DC. Also, must mention that it is a skort aka skirt+shorts, which can sometimes be weird in fitting, but if you find right one it is a blessing. You can be you (reckless) and still give an illusion of wearing a (girly) skirt. 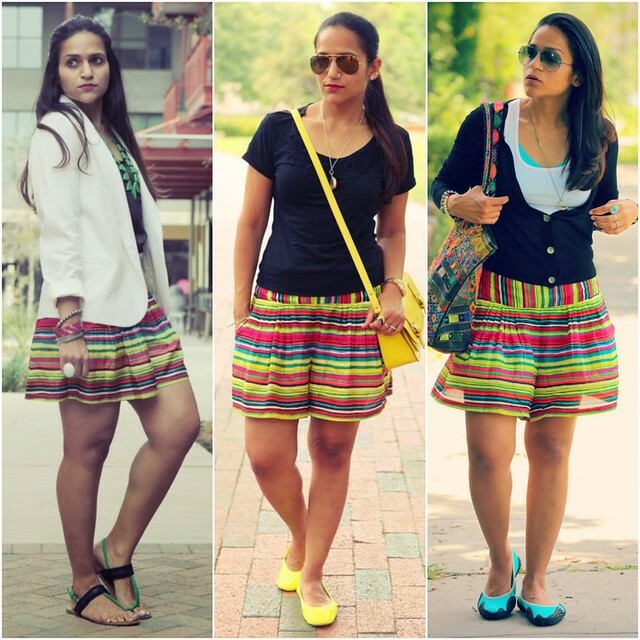 What are your thoughts on skorts? Do you own one or would like it? I was all set to type that look #2 was my favorite, but I love #1, too! You're so great at styling pieces!! Skorts can be weird, but it's really nice when you find one that fits so well and that can be worn with versatility. I do own a few but I haven't worn any in a while. I couldn't agree more on the reasons you've given why you love this skort. The right fit in a vibrant color scheme is a huge plus in summers. You are workin that outfit girl! Very pretty! I love it with the white blazer!